We offer Compulsory Basic Training courses 7 days a week, at a fully inclusive price of £130 (or £120 on weekdays). Bike hire, insurance, helmet and equipment supplied, or at a reduced rate of £90 (£100 on weekends) when you use your own bike. ** Don’t worry if you’ve never ridden before, the CBT is not a test, rather training with continual assessment tailored to each student. 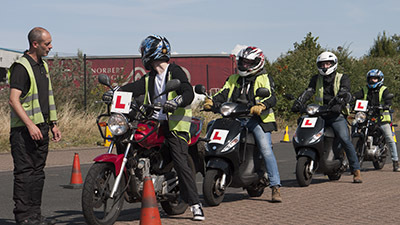 A CBT is perfect for someone looking to ride a moped, scooter or small motorcycle. Throughout the day you will be walked through each of the individual requirements that make up the five CBT modules, for each one you must demonstrate you are competent and safe. 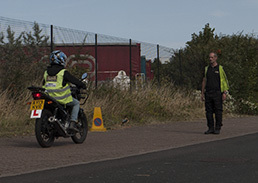 Once you complete all 5 modules you are issued with a DL196 certificate which is valid for 2 years and will allow you to ride up to a 125cc (depending on your age) with L plates, on the road and unattended. Contact us via phone (during office hours, 7 days a week) or live chat (Monday – Friday). Alternatively visit our contact page to send us a message and one of our team will get back to you as soon as possible. On-road tuition with your instructor (with a maximum of 2:1 Student/Instructor ratio), with further training on practical application of each of the previous modules, practicing everything you have learned. Make sure the tank is full so as to not interrupt your training! *Anyone who obtained a full car licence before 1 February 2001 already holds moped entitlement and are not required to complete a CBT. Normally a one day course. Learn on a 50cc (16). Learn on a 125cc (17+). Ride up to 50cc at 16. * You do not need to take a CBT if you passed a car driving test before 1st February 2001.